There are some events and occasions which binds every Indian; you can hear the conversations in the local train, on the road side dhabas, within family gatherings and during water-cooler gossips in office. Here, we present 5 of these national news which every Indian talked about when it happened. The year 2013 started with the largest gathering of human beings anywhere in the Universe: The Maha Kumbh Mela. Held between 14th January to 10th March, 2013 at Allahabad, this year’s Kumbh Mela attracted more than 100 million people from all spheres of life. People who were religious or simply curious thronged to Ganges ghats in Allahabad and immersed in the divine energy of faith and love. February 10th, 2013 was the day when more than 30 million people gathered in Allahabad to take a dip in the Holy River; which is the single largest gathering of human beings in a single day, anywhere in the world. November 5th, 2013 would be remembered as one of the most memorable days for science in India. At exactly 14.38 hours, Mangalyaan was launched from Satish Dhawan Space Centre SHAR located on Sriharikota Island in Andhra Pradesh. It was a proud moment of all Indians as this space-ship was conceptualized and developed by our very own ISRO (Indian Space Research Organization). It exhibited the expertise and command we Indians have over science and technology. Mangalyaan has currently completed its first mid-course correction and has travelled 2.9 million kms from Earth; an achievement which no other spaceship from India has ever accomplished. Directed by Rohit Shetty and starring Shahrukh Khan and Deepika Padukone, Chennai Express was released in August, 2013. Reviews were not that great about this romantic-action-comedy movie, as the script was pretty lame and acting not above average. Some songs were nice hits, and everyone expected this movie to recover its production cost. But something in between happened which no one had anticipated: It broke all Bollywood records inside India and overseas! As of now, Chennai Express has grossed over Rs 395 crore, which is the highest for any Bollywood movie. It surpassed 3 Idiots box office collection, which was the highest-grossing Bollywood movie before August, 2013. It reinstates one fact in the entertainment niche: Nothing can be predicted. Janta rules! November 16th, 2013; Wankhede Stadium and thousands of fans standing in respect for the God of Cricket: Sachin Tendulkar. This scene and the moment will forever sketched inside the minds of every Indian who loved Sachin as he retired from Cricket by playing his 200th Test match on that day. Even now when you listen to his farewell speech, you can feel a lump developing inside your throat and eyes getting moist. Sachin, the cricketer, was India’s pride; darling of every mother and inspiration of every kid. When he retired, everyone in India stood up and bowed before this humble sportsman who was worshipped and adored. Sachin’s retirement was the most defining moment in India’s sport’s history. We will keep on loving you Sachin! When Arvind Kejriwal decided to launch his Aam Aadmi Party and contest the Delhi assembly elections directly fighting against Congress, everyone was amused. How can a non-political person, an IIT pass out and ex-Government officer can fight India’s oldest political party, that too in the heart of India? Every well wisher advised him to roll back his nomination as pitched against Sheila Dixit, the sitting CM of Delhi since last 15 years. Congress veterans ridiculed him, made fun of him and announced that Arvind Kejriwal has gone mad. Skeptics and nay-sayers were stunned when Arvind Kejriwal destroyed Congress and defeated Sheila Dixit right in her constituency. Congress party was routed as all their winning MLAs (numbering 8) can now be accommodated inside an Innova car! A new dawn of Indian politics has begun with the arrival of Arvind Kejriwal. What are some of the other significant news of 2013 that you think made significant impact on Indian citizens? 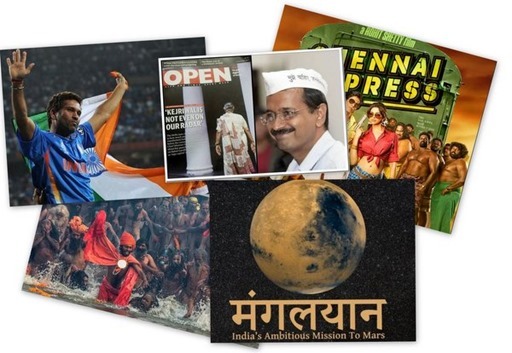 "5 Major News Events Of 2013 Which Every Indian Talked About", 5 out of 5 based on 1 ratings.